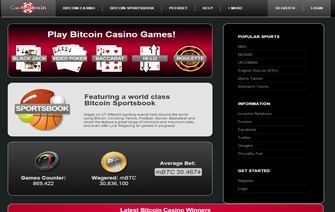 CasinoBitco.in, founded in June 2013, seeks to provide players the opportunity to wager Bitcoin at an online casino that also boasts a well-rounded sportsbook. Its design displays a simple, but polished, look and is quite easy to navigate. While simplicity seems to be the theme of CasinoBitco.in, its approach is unquestionably geared towards players of all different levels. As players choose between the five different selections, within the casino, and the plethora of North American sporting league choices that the sportsbook contains, a feeling of being too overwhelmed is certainly not an issue. The overall functionality, combined with the openness to all levels of players, makes CasinoBitco.in a place that an average player might enjoy. “With our official launch coming in the month of June, 2013, CasinoBitco.in was the first Bitcoin Sportsbook to offer truly Provably Fair Bitcoin Casino Games, starting with Blackjack. Over the period of our site’s time online, based on player feedback and demand, we’ve been able to expand and enhance our offerings and maximize the amount of choices given to our loyal players. At CasinoBitco.in, no download is required. All of our games are able to be accessed in all browser types and from a majority of mobile devices. Our credibility has been untarnished throughout our time online and ultimately fee as if we are one of the premier established leaders, in the Bitcoin Gambling space. The casino game selection at CasinoBitco.in, might be a bit underwhelming for some players that look at its URL and were expecting a large quantity of games. The fact is that CasinoBitco.in only has a total of five selections, within their casino. So for players seeking a high quantity of different casino choices, CasinoBitco.in would not necessarily fit the bill. What is offered, though, are five of the most popular games that are usually found at all casinos. CasinoBitco.in offers HTML5 versions of: Blackjack, Roulette, Video Poker, Baccarat, and a Hi-Lo card game. Each game played offers the ability to verify the results of the game, as part of the Provably Fair seed and hash verification. Although the graphics of the games might look a bit outdated, the HTML5 platform allows for easy accessibility, throughout a player’s options of accessing the site. Each game has a one mBTC minimum bet, with up to a 2BTC maximum bet, depending on the odds of the particular game or wager within the game. While it is evident that the bells and whistles of a grand design weren’t implemented, the casino’s appeal is mostly targeted at the players who prefer continual functionality over the complex designs of game selections. The sportsbook at CasinoBitco.in is what they truly hang their hat on. They offer the most up-to-date lines on all the major US sporting events and leagues. They are also able to provide first-half and second-half lines on both college football and on the NFL. For baseball, they offer a 5 inning line and on both college and NBA basketball, they offer first-half lines. As far as breakdowns go of games, these seem to be the most specific selections that are currently offered, for players who bet on multiple quarters and props. Mainly tailored to a US audience, it is a bit surprising that they do not offer the prior mentioned selections, but are considering implementing them within the coming months. Since they recently have added both in-game live betting and they parlay card, up to six teams, changes seem to be rolling in every day. As this is tailored to mostly US leagues and sporting events, not too many international sports and sporting leagues are provided, at this time. As they do have a few limited choices on soccer selections, they mostly come from the more popular international leagues, such as La Liga and the English Premier league. They also have hockey but that is limited to the NHL only, and the few tennis selections that are provided at this time, have very few odds actually listed. This is also the case with most of the boxing choices, as well. The less popular the sport, the less that it looks CasinoBitco.in has for it. All in all, CasinoBitco.in has a nicely designed sportsbook, but much like their casino, would not impress players seeking a more detail and quantity-related Bitcoin gaming site. “Please note that we strive to ensure over 98% of all withdrawals are processed instantly. CasinoBitco.in offers a 10% comp bonus for their casino, as their main listed bonus. They also seem to run promotions from time to time, that do require some sort of wagering but also provide free contests, open to the public. Customer support at CasinoBitco.in is one of the best features they provide. Although they do not provide live chat currently, they are very quick to get back to a player’s concerns or questions through email. Responses are usually returned within one to four hours, and always include a professional and detailed response. CasinoBitco.in’s casino is verified by the Provably Fair implementation, as each individual bet can be checked for accuracy, by the player themselves. CasinoBitco.in is an overall good place for a player to venture to, that does not quite need the overwhelming selections that other casinos may offer. It is noticeably tailored to a North American demographic when it comes to the sportsbook side of things, and has more selections provided for the most popular leagues. CasinoBitco.in can be summarized as “a simple Bitcoin gaming site tailored to North American sports leagues and casino games.” The highest mark goes to the customer support, as they continually provide timely responses and are very professional in doing so. As CasinoBitco.in keeps growing, it is believed that the selections and features will too.